Dakota Thompson clears the pole during his high jump session. Photo provided by butlersports.com. Butler University’s men’s and women’s track and field team made the quick drive to West Lafayette Jan. 28 to compete in the Fred Wilt Invitational at Purdue University. The Bulldogs dominated the men’s 600-meter run by taking all three top spots. Graham Stecz finished first with a time of 1:24.27. Freshman James Route was not far behind, taking second place with a time of 1:27.26, followed by Connor Fuller in third with a 1:28.42 time. Juniors Michael Carey finished third in the mile with a time of 4:22.89. 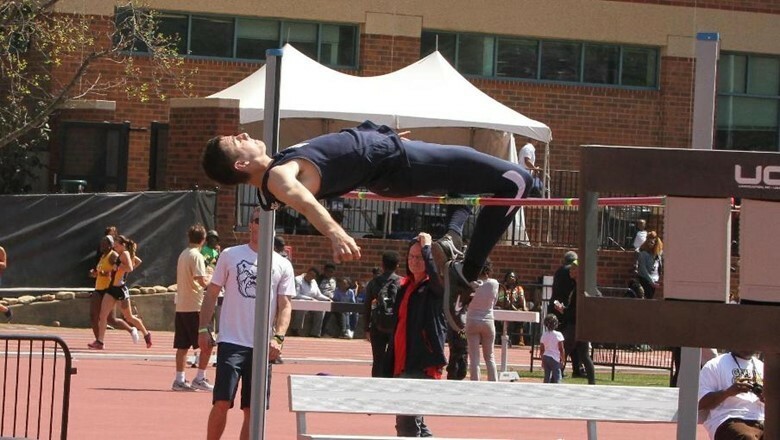 Dakota Thompson took home third place with a height of 1.96m in the high jump. Sophomore Tim Vestuto finished 60-meter dash with a personal best time of 7.03. For the women’s team, only freshman Kara Stark placed in the top-5 in a single event for the Bulldogs. She finished fifth in the 800-meter run with a final time of 2:27.61. The Butler women’s 4X400-meter relay team did place fourth at the invitational. The freshman team of Emma Laux, Madeline Miller, Lizzie Rupkey and Perrie Smalley finished with a time of 4:20.68. Butler will continue its indoor schedule by taking a portion of their roster to the prestigious Meyo Invitational at the University of Notre Dame Feb. 3-4. The 2-4 p.m. hour block on Saturday can be seen live on ESPN3.